MIAMI BEACH – The much-ballyhooed “U.S. 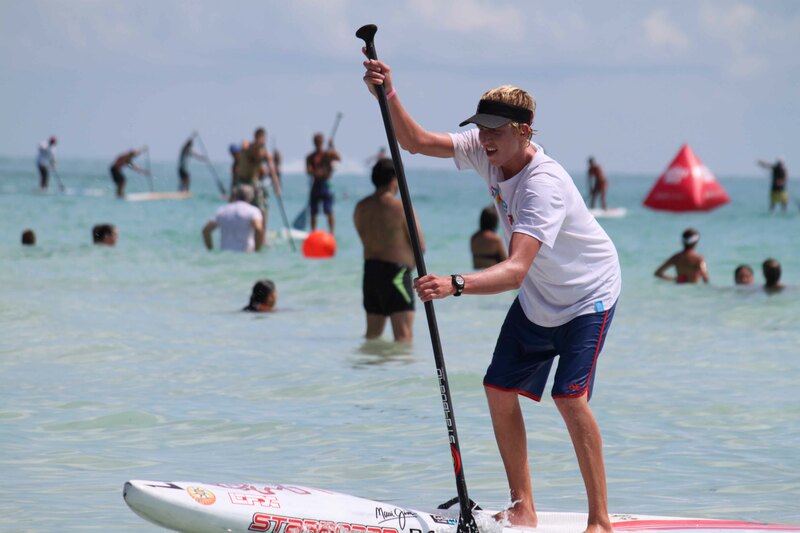 Open of SUP” debuted on South Beach today and if you were looking for a postcard-perfect setting and a crowd of spectators where thong-clad women outnumbered stand-up paddleboarders, you came to the right place. We love thong-clad spectators, especially when they keep drifting into our camera lens when we’re trying to shoot paddleboarders. But we were expecting more than 65 athletes to show for a shot at $35,000 in prize money, a record SUP purse according to the Exclusive Sports Marketing announcer who mentioned it at least 65 times over the course of two sweltering late-morning races. You’d think ESM, which is based in South Florida and has put on triathlons and volleyball events forever, could have drawn more athletes from its home market. As it was, it seemed at least a third of the group came from out of town, including Connor Baxter and Candice Appleby, who both flew in from Hawaii and won the male and female divisions, respectively, of the 5-mile elite race, which featured 37 athletes. Baxter, who will be 17 this week, won $6,000 as the male winner, finishing in 52:04, more than a minute ahead of Chase Kosterlitz (53:17) of St. Petersburg, who took home $4,000 as runner-up. Appleby (55:33) won $4,000, narrowly holding off Annabel Anderson of New Zealand in a five-loop race that borrowed its format from the popular Battle of the Paddle in California. After each lap, athletes exited the ocean and circled through a 20-yard water stop before reentering the water. The format, along with top-notch race shirts, cool tiki trophies, and a tent city of sponsors including Mix1, 5-Hour Energy, and a coconut water provider, gave the U.S. Open a big-event feel. The race itself was well organized, even with starting times pushed back to 10 a.m. for the 3-mile open race and 11:30 a.m. for the elite. I continue to wonder why SUP races don’t begin at 8 a.m, especially in Florida during the summer months. Baxter, one of the top SUP racers, said it was by far the hottest race he’s ever participated in. Twenty-eight athletes raced in the three-mile stock board division. 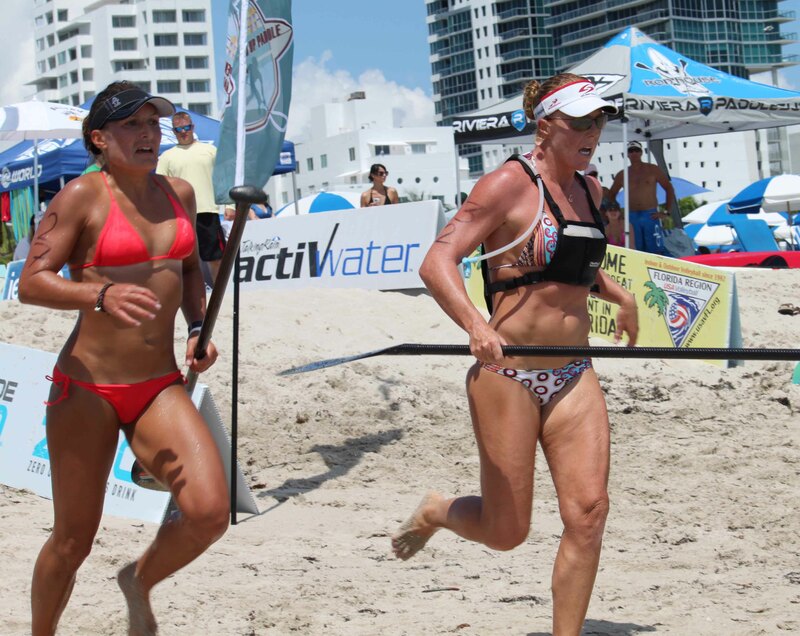 Trish Miller, a yoga/SUP instructor whom I met during Brody Welte’s Paddle Fit class in Clearwater earlier this year, won the women’s division with a time of 38:15. Not bad considering she and her Key West contingent jumped in the race with just two and a half hours of sleep. “And I borrowed a board,” she said. Bottom line: This event shows promise and if ESM is willing to move it to cooler weather in November or December, when there’s nothing else on the race calendar and the SUP world would be thrilled to visit South Beach, it might have something special. Pretty accurately written. Was a great day/race as it always is in the SUP world, but surely could’ve been a HUGE success bringing out 100’s of paddlers if marketed better, with more reasonable entry fees, and a more condusive location…hotel parking was expensive and not well organized, internet service was iffy, and would’ve been nice to have some snacks, light meal or protein bars offered to the athletes on the beach. The SUP interest is definitely happening in Miami, we just need to market it, offer it and the SUP industry will take off in the Magic City! 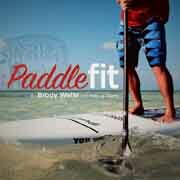 Nonetheless, let me end by saying… a SUP day/race at the beach…is ALWAYS a SUPER day! Irma — You upstaged the blog. Outstanding! 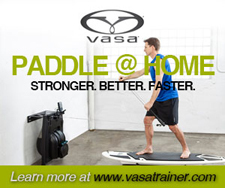 Any time you want to guest blog on SUP, just let me know! Check Connor’s age. I am pretty sure he is 15 years old (for a couple more days). It makes his win even more impressive. Betsy: Good catch. Thank you. His Web site says he was born in September 1994. Either way, he’s a very mature young man. This was by far one of the funnest races I,ve raced in. I was on the fence with the high registration fee. I wish we would start @ 8am also.It With the fees being so high, it would have been nice to have some healthy snacks down there. I dont know the purpose of the tents , advertising food(babybell,jet blue, sports authority) and none there.Luckily one of our Lazy Dogs, brought some snacks so we wouldn’t melt away in the heat, Roray is the best commentator and this event would’nt have been such a success without him! Right on Irma!!!! I have to say of all the races we have traveled to this was certainly a nail biter all the way!!! Having everyone in from all over the country DEFINITELY mixed things up on the Florida SUP scene and gave everyone a run for their money!! It was an intense adrenaline rush kind of day and was non stop action. It was so exciting to watch and to be a part of! Great call on having Rory Kam as the MC as he ALWAYS puts on an amazing race and the fact that he knows everyone puts that extra fun spin on things! The guys may want to use him as a go to guy for the next race as he seems to know what works. Also, where the hell was the raffle…….may sound silly but that does bring in alot of cash (especially from us women!!! You know we like to spend!) It can produce some revenue and makes it alot of fun so that people walk away feeling like the won something. Also, market the hell out of it on facebook. Dont ever underestimate the power of FB with SUP races! Its our biggest tool for Lazy Dog and people LOVE seeing pics and results posted. I have to say this was the most fun we have had at a race yet!!! Lazy Dog will surely be back next year!! !